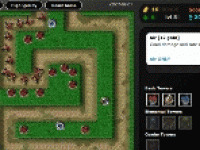 Games online brings tower defense game - Creeps Procession. In this game, you have the option to specify the path that creeps will go. Then you can, as usual, place a cannon and try to destroy all creeps procession to be able to go to the next level. Choose related Creeps Procession game online.